I doubled the ‘sauce’ element because I also made mushroom pies and wanted them to have the same flavour. I bought two whole rabbits and poached them in a slow cooker for about 5 hours in chicken stock with a carrot, onion and some celery and black pepper. I omitted step 2 and added the shredded meat after step 3. This is because I used the same sauce/roux for the mushroom pies. 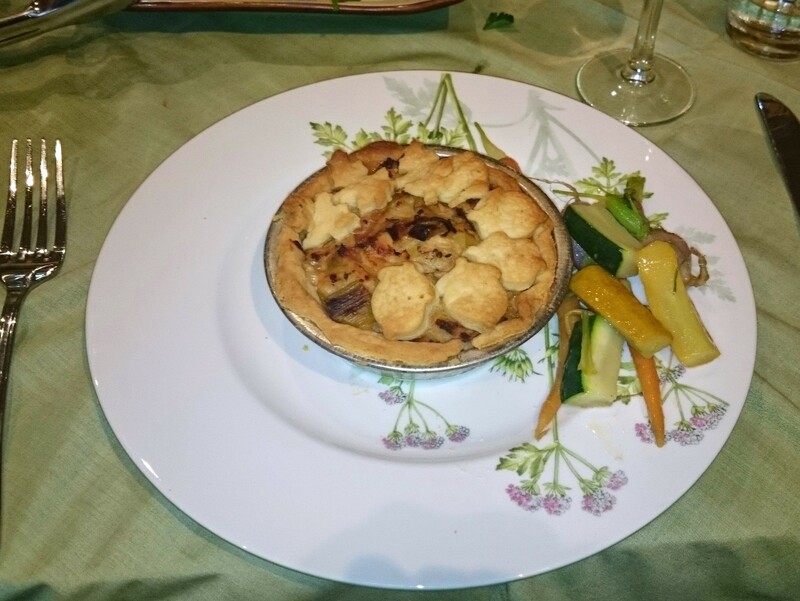 I made my own shortcrust pastry to Stephanie Alexander’s recipe (Cooks companion – see below). I did 1.5 times the quantities. I bought Careme gluten free shortcrust pastry which tasted delicious and turned out perfectly but was awful to roll out and I ended up just pressing blobs of it into the pie tins. For both mushroom and rabbit pies I rolled out the pastry and used individual pie dishes (you could also make two or three big pies depending on the size of your pie dish). I then blind baked the pastry for about 10 minutes (same for a single large pie). I then filled with the mixture, added some small pastry cut outs to the top (I didn’t have enough pastry for lids) and baked in the oven 180C for approx 25 mins (you may need to cook slightly longer for a large pie – 30-35 mins but as the filling is already cooked it is really just the pastry you’re trying to cook so be careful not to burn it). I used the same ‘sauce/roux’ as the rabbit pies. After Step 3 of the rabbit pie recipe I split the sauce into two saucepans. In a separate frypan I fried mushrooms and butter and thyme over a low heat until the mushrooms were softened (probably about 10-15 mins) stirring regularly. I then added the mushrooms to the roux and cooked over a low heat for another 10 mins. To make the shortcrust pastry, cut the butter into small chunks and pop them in the freezer briefly. Sieve the flour into a bowl and tip the butter in. Rub the butter into the flour so that only pea-sized bits remain. Make a well in the middle of the flour and butter mixture and pour the water in (only a tablespoon at a time – you may not need all the water – it is unlikely you will need more). Stir together with your fingers or a pastry scraper until it forms a loose dough. Tip the mixture out onto the bench top and use the heel of your palm to push the mixture away from you, smearing the butter onto the bench top. Regather the mix and repeat. Do this five or six times (the mix should look like a fairly cohesive dough by now). Pat the dough into a circle about 1 cm thick, wrap in plastic wrap and pop it in the freezer for 15 minutes or so.